3.4 GHz 144 MHz FT817 to 9 cm 20 Watts TRV now locked to a 10 MHz reference. W5LUA preamp on RX. Below; 3cm (10 GHz) amateur band transverter, locked to a 10 MHz GPS reference or internal OCXO - TRV is a VK3XDK design. Below; New VK3XDK 9 cm (3399 / 3400 MHz) with 432 MHz IF, completed July 2011. 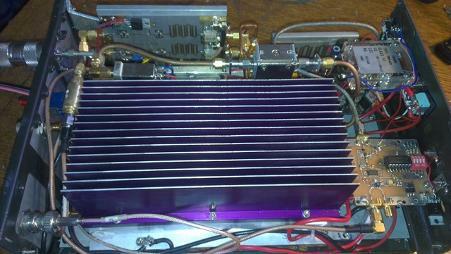 22 Watts TX and locked to a 10 MHz external reference.